This lifesaving technique is applicable to a range of emergencies, including cardiac arrest, choking episode, and drowning. Each has key components in common: the person is unconscious and has ceased breathing. 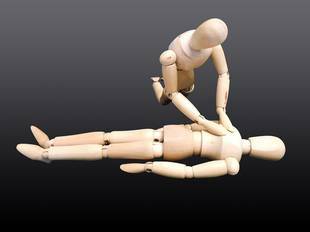 Training in cardiopulmonary resuscitation (CPR) will prepare you to handle these life-threatening emergencies effectively. Death comes quickly when the heart stops: the absence of oxygenated blood can cause irreparable brain damage in only a few minutes and death can occur in 8 to 10 minutes. Time is all important when you are helping an unconscious person who is not breathing. Thus, the cardinal rule if you are alone is to immediately begin cardiopulmonary resuscitation. "A" is for airway. Many procedures are involved in cleaning the victim's airway, beginning with an assessment. The first step with an unconscious person is to be sure that he or she is not simply resting or sleeping. Firmly shake or tap his or her shoulder and ask, "Are you okay?" If you get no response, immediately shout for help. If you are alone, begin CPR immediately and continue for 1 minute before seeking assistance. If you are not alone, direct someone to call your local emergency number or your local ambulance service. Lay the person on his or her back. If necessary, roll the person over so that he or she is face up. Position yourself at a right angle on your knees, perpendicular to the person's neck and shoulder. This is the primary maneuver for opening an airway. Position your palm on the person's forehead and gently push backward, placing the second and third fingers of your other hand along the side of the person's jaw, tilting the head, and lifting the chin forward to open the airway. Check if the person is breathing, positioning your ear directly over the person's mouth. Look across the person's chest for the rise and fall of breathing. Listen for breath sounds. Feel for air on your face. If no breathing is evident, begin mouth to mouth resuscitation immediately. "B" is for breathing. In the absence of emergency equipment or professional medical help, the restoration of the flow of oxygen to the lungs is best done by mouth-to-mouth resuscitation. The basis of mouth-to-mouth resuscitation is simple: you are to provide breathing for the victim. You are to expel breath from your lungs into the victim's nose or mouth. Position yourself at a right angle to the person's shoulder. Use the head tilt/chin lift maneuver and pinch the person's nose close using your thumb and forefinger. Take a deep breath. Open your mouth wide and place it tightly over the victim's mouth. Exhale into the victim. Remove your mouth from the victim's, inhale and do it again. Deliver two big breaths. Observe the person's chest with each breath to note whether the air you are breathing into the person's chest with each his or her lungs to expand. Make sure you let the person exhale before delivering more breaths. If the victim's stomach bulges excessively, the airway may be blocked, or your breaths may be too full. After you have delivered two breathes, position two fingers to the side of the victim's Adam's apple. If the heart is pumping, the carotid artery on either side of the neck should be pulsating. If you do not feel it immediately, move your fingers a fraction of an inch up and down to be sure you are in the right place. If there is no pulse, cardiac compression is necessary to circulate blood to the brain. If the person has a pulse but is not breathing, continue mouth-to-mouth resuscitation. Using the same technique, blow a big breath into the adult victim every 5 seconds (12 breaths per minute) take your mouth away between breaths. Listen for signs of breathing and watch chest movement. If the victim is breathing but the breaths are weak, shallow or labored, mouth-to-mouth resuscitation may still be appropriate. However, coordinate your breathing assistance with the victim's breathing: deliver a breath when he or she inhales, and allow the person to exhale before you breathe for him or her again. "C" is for circulation: the blood flow must be restored in order to deliver oxygen to the brain. Without oxygen, brain cells will die and in a matter of minutes, irreversible damage can result. If you are unable to find a pulse in an unconcious person, heart compressions are necessary to restore circulation. Also called closed heart massage, the heart compressions must be coordinated with mouth-to-mouth resuscitation: the breathing delivers the air to the lungs, then the heart massage pumps the oxygenated blood to the brain and other parts of the body. Work from a kneeling position at right angles to the victim's chest. Find the base of the breastbone at the center of the chest where the ribs form a V. Position the heel of one hand on the chest immediately above the V; with the other hand, grasp the first hand from above, intertwining the fingers. Shift your weight forward and upward so that your shoulders are over your hands; straighten your arms and lock your elbows. Shift your weight onto your hands to depress the victim's chest (it should fall about 1 1/2 to 2 inches in an adult. Count aloud as you do it, five times in an even rhythm, slightly faster than 1 compression per second (80-100 per minute), one-thousand-one, one-thousand-two and so on. Repeat the pattern three times for a total of 15 chest compressions. You must also give the person oxygen. Use the same technique outlined above for mouth-to-mouth resuscitation. Use the head tilt/chin lift maneuver to open the airway. Pinch the nose closed with the thumb and forefinger. Take a deep breath, then cover the victim's mouth entirely with yours. Exhale into the victim. Give two slow breath. Repeat. Pump the person's chest 15 times, then breathe for him or her twice. Establish a regular rhythm, counting aloud. Reassess pulse and breathing after 4 cycles. Continue until help arrives.